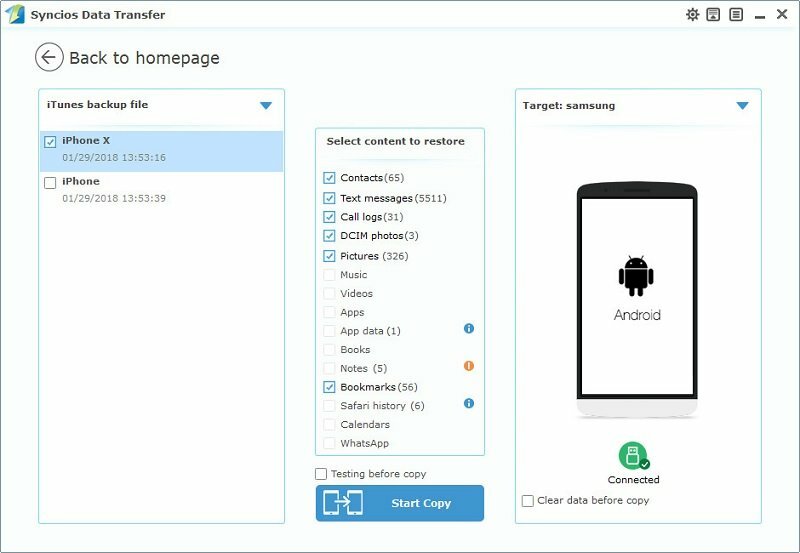 To transfer contacts, messages, music, videos, photos, call histories, apps and more from iPhone to new Samsung Galaxy S9 effectively, we need a powerful phone tool to help us in reducing time wasting. This article will provide you a simplified guide on transfer iPhone data to Samsung Galaxy S9. Three easy solutions are enough for you to finish transferring. To transfer your data from iPhone to Samsung Galaxy S9, click "Start" button under "Phone to Phone Transfer" section on the homepage. Connect both of your phones to Syncios via USB cables, Android devices can also be connected via WiFi. To move data from iPhone to Samsung Galaxy S9, simply check the data you want on the middle panel after Syncios successful loading your data. Then, click Start Copy. 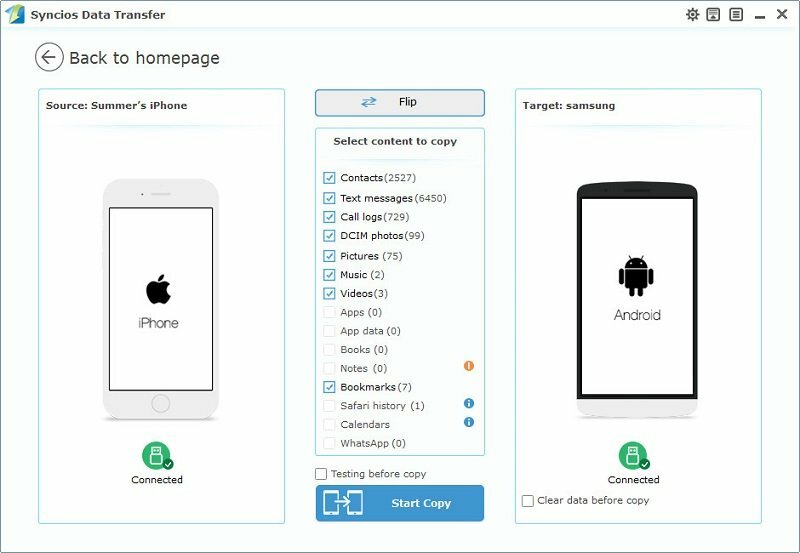 Please make sure iPhone on the left and Samsung Galaxy S9 on the right, otherwise, you can click on "Flip" button to exchange the source and target device . Now, you can see the iPhone contacts/sms/music and more on new Samsung Galaxy S9. Download the handy tool and follow the steps to transfer data from iPhone to new Samsung Galaxy S9. If you accidently lost or sold your iPhone and urgently need to backup your iPhone data to new Samsung Galaxy S9. Syncios can still help you finish this jpb as long as you have backed up your iPhone to iTunes. To transfer your data from iTunes backup to Samsung Galaxy S9, click "from iTunes Backup" button under "Restore from iTunes" section on the homepage. All your iTunes backup will show on the left list, pick the desired one. Syncios will allow you to restore Contacts, Call logs, Messages, DCIM photos, pictures and Bookmark from iTunes backup to Samsung Galaxy S9. Syncios Mobile Transfer also designed for helping users to restore data from iCloud backup to iOS/Android devices. You can use this program to recover data from iCloud backup to new Samsung Galaxy S9, just follow the steps below. 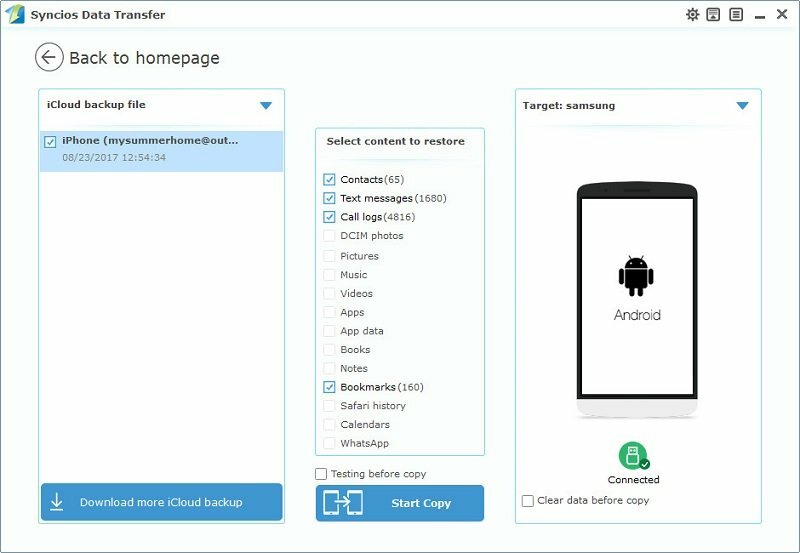 To transfer your data from iCloud backup to Samsung Galaxy S9, click " Restore from iCloud" button on the homepage. Syncios will allow you to restore Contacts, Call logs, Messages, DCIM photos, pictures and Bookmark from iCloud backup to Samsung Galaxy S9.